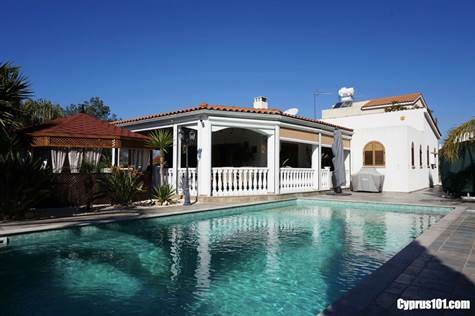 Kissonerga, Paphos – This stunning home is located in a quiet residential area of the popular village of Kissonerga, within easy walking distance to the local village shops, restaurants and amenities. The site of the recently approved Marina project is a 5 minute drive away, making this area highly sought after. * Air Conditioning, Ceiling Fans & Double Glazing Throughout. * Central Heating with Potterton Boiler. * Stone Effect Fireplace with Granite Mantle & Gas Flame Fire. * Archways with Decorative Architrave. * Flooring – Tiling & Light Oak Laminate. * Shutters – Aluminum Wood Effect (8 arched) all with fitted Security Locks. * Fly Screens and Front Door Concertina Flyscreen. * Fitted Wardrobes in all Bedrooms and additional Fitted Cupboards in Hallway. * Light Oak Colour Fitted Kitchen including Black Granite Worktops and White Goods. * Chrome Heated Towels Rails & Vanity Units in both Shower Rooms. * Yale Alarm System (Wireless) with Key Fob Entry. * Covered Veranda has enclosed Electric Automated Blinds for Shade and Security. * 10m x 5m Tiled Swimming Pool with Aqua Green Mosaic Italian Tiles, Granite Edge Tiles and Granite Roman Steps with Granite Coping Stone Finish around pool perimeter. * Hot Tub – Presidential – with overhead purpose built pergola with neutral curtains surrounding for added privacy. * Automated Wrought Iron Electric Entrance Gates (with bell). * Fully enclosed Mature Landscaped Garden with full Digital Irrigation System and a wide variety of trees including, Palm, Avocado, Lemon, Orange, Apricot and Nectarine. * Retaining Boundary Wall with Wrought Iron Railings to the front and length of drive. The rear and side wall has added Ornate Fencing for added privacy. * Car Port space for two cars and further space on open driveway for two more cars. * External Utility Room with fitted sink and toilet. The accommodation features a spacious L-shaped living/dining room, separate kitchen, large master bedroom, 2 further good size double bedrooms, 2 stylish shower rooms, study room, 58 sqm covered veranda and external purpose built utility room. Sliding patio doors from both the lounge and master bedroom provide direct access to the outdoor veranda where there is room for a comfortable seating area, dining space and even a games table. It’s an amazing setting for al fresco dining, parties and entertaining and the 8 seater hot tub with purpose built private gazebo above adds to the luxury setting and enjoyment of this wonderful outdoor space. There is a further patio area perfect for sunbathing by the 10m x 5m aqua green mosaic tiled swimming pool with granite roman steps for easy access. In summary this is a truly unique property in a quiet village setting, close to the coast, amenities and new Marina project. The condition and finishes are superb and it has been lovingly cared for by the current owners.